Gluon Walls: A New Form of Matter? 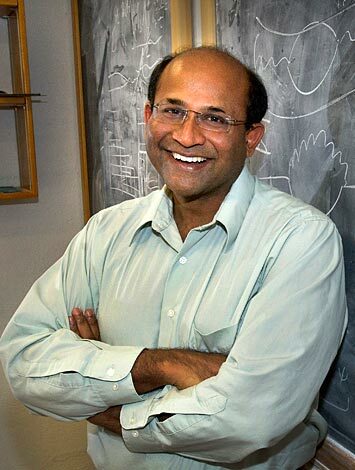 We sat down with Brookhaven theoretical physicist Raju Venugopalan for a conversation about “color glass condensate” and the structure of visible matter in the universe. Q. We’ve heard a lot recently about a “new form of matter” possibly seen at the Large Hadron Collider (LHC) in Europe — a state of saturated gluons called “color glass condensate.” Brookhaven Lab, and you in particular, have a long history with this idea. Can you tell me a bit about that history? A. The idea for the color glass condensate arose to help us understand heavy ion collisions at our own collider here at Brookhaven, the Relativistic Heavy Ion Collider (RHIC)—even before RHIC turned on in 2000, and long before the LHC was built. These machines are designed to look at the most fundamental constituents of matter and the forces through which they interact—the same kinds of studies that a century ago led to huge advances in our understanding of electrons and magnetism. Only now instead of studying the behavior of the electrons that surround atomic nuclei, we are probing the subatomic particles that make up the nuclei themselves, and studying how they interact via nature’s strongest force to “give shape” to the universe today. We do that by colliding nuclei at very high energies to recreate the conditions of the early universe so we can study these particles and their interactions under the most extreme conditions. But when you collide two nuclei and produce matter at RHIC, and also at the LHC, you have to think about the matter that makes up the nuclei you are colliding. What is the structure of nuclei before they collide? We all know the nuclei are made of protons and neutrons, and those are each made of quarks and gluons. There were hints in data from the HERA collider in Germany and other experiments that the number of gluons increases dramatically as you accelerate particles to high energy. Nuclear physics theorists predicted that the ions accelerated to near the speed of light at RHIC (and later at LHC) would reach an upper limit of gluon concentration—a state of gluon saturation we call color glass condensate. * The collision of these super-dense gluon force fields is what produces the matter at RHIC, so learning more about this state would help us understand how the matter is created in the collisions. The theory we developed to describe the color glass condensate also allowed us to make calculations and predictions we could test with experiments. Q. Have we seen hints that this color glass condensate exists at RHIC? A. The very first experimental hints of color glass condensate came from early collisions of gold ions at RHIC in 2000 and more significantly later from collisions of light deuterium ions with the heavier gold ions. The precursor for the LHC phenomenon was seen around 2006 by scientists from RHIC’s STAR collaboration and subsequently PHENIX and PHOBOS. They all saw signs that particles streaming out of the collisions were correlated in an interesting and surprising way that showed up as a little bump on the graph—which we called a “ridge” because it looked like a mountain ridge. RHIC and LHC scientists now use sophisticated analyses to break down this signal into subtle wiggles of varying strengths, which can be further analyzed. Key aspects of the wiggles in particle correlations could be explained by the “flow” of the hot dense matter produced when the ions collide—which we now know is a liquid-like plasma of quarks and gluons. But the surprising correlations also carried important information about the very earliest stages of matter formation, telling us about how gluons inside the colliding nuclei were creating this matter in the first place. The experimental information was consistent with the structures being generated by very strong gluon force fields at very short distances within the colliding nuclei—distances, predicted by gluon saturation, to be much smaller than the proton size. The other strong piece of evidence for color glass condensate and gluon saturation we alluded to came from deuteron-gold collisions at RHIC in 2003, which do not create quark-gluon plasma. Certain particles streaming out in the “forward” direction, which the BRAHMS experiment was particularly designed to detect, were suppressed. That is, fewer particles with a given momentum were coming out at this particular angle than had been expected. It appeared that instead of the deuteron colliding and interacting with individual protons or neutrons in the gold nucleus, the smaller particle was hitting a bunch of protons simultaneously—or a dense field of gluons that acts like sticky molasses, making it harder for particles with a given momentum to be produced. PHOBOS, STAR and PHENIX also saw similar suppressions. This was a genuine prediction of the color glass condensate picture. Further experiments at RHIC by STAR and PHENIX during the 2008 deuteron-gold run drew out more details on particle correlation patterns predicted by the CGC theory. Q. Do the “ridge” correlations have any significance aside from being possible indications of gluon saturation? A. All the extra wiggles give you much more information about the structure of the flow—similar to the way astronomers have learned how subtle fluctuations in the cosmic microwave background radiation have left their fingerprints on the structure of the universe today. So the discovery of the “ridge effect” at RHIC led us to understand how the details of the initial conditions could lead to detailed variations in the flow of the matter produced at both RHIC and the LHC. To understand the properties of the quark-gluon plasma, we need to understand the initial conditions in detail. In addition, the ridge may be imaging how strong force field lines behave between color charges, just as the distribution of iron filings around a magnet tells us about the magnetic flux around a magnet. If this analogy is borne out, that would be quite fundamental information about the strong force. Q. How did these findings affect the development of theory? A. There were still other possible explanations. That’s how science works. You need to accumulate more and more evidence. With each experimental finding, your model gets tested and refined. The next piece of data can fracture it. Some people try to disprove the model. Other people did a lot of work to refine the theory and make it stronger. So, we made some predictions about what we might see in future experiments, both at RHIC and the LHC. Thus far the heavy ion results from the LHC are consistent with our expectations. Then, physicists from the CMS collaboration at the LHC, several of whom had worked on RHIC’s PHOBOS detector, used their experience with RHIC collisions to look for the same thing in proton-proton collisions at LHC—at 14 times the energy of the highest-energy proton-proton collisions at RHIC. Because of the higher energy level, they were able to look at extremely rare events where more than 110 charged particles come out in a single collision of two protons. By picking the events with lots of particles, they are essentially choosing the events where gluons are at their highest concentration in the colliding protons. In these rare events, they saw a tiny ridge, just like the one in gold-gold collisions at RHIC. We spent half a year trying to understand this. We had developed this theory to predict and explain the ridge, but we thought it would only be observed in heavy ion collisions. But one of the theorists had predicted it would be there in proton-proton collisions at the LHC, and there it was. It couldn’t be due to quark-gluon plasma, because you don’t have a big enough system with proton-proton collisions. It had to be caused by gluon saturation, not flow of QGP. When we looked in detail at the LHC data, we were able to explain how these effects would change with various conditions, and we were able to explain things more quantitatively. Then, when we knew they were going to be doing a very short preliminary run of proton-lead collisions at LHC in late 2012, we made some predictions about what would be seen there. Q. What did the LHC proton-lead experiments observe? Did these data match your predictions? A. So the LHC did these proton-lead collisions in a pilot run for just four hours, but they got an immense amount of data—sufficient to see something really dramatic. They observed the same ridge effect we had seen in gold-gold collisions at RHIC. These collisions were at much higher energy—25 times the energy of the deuteron-gold collisions at RHIC. So you get more of a gluon shockwave and a lot more particles coming out. There was enough data to do much more stringent tests of the idea of gluon saturation by looking for these correlations. In proton-lead collisions they saw a bigger signal than in proton-proton collisions—about six times larger, even in collisions with the same number of particles coming out. The QGP flow explanation would have given you roughly the same signal size for the same number of particles produced, so that seems unlikely to me. Instead, to me, the result is sort of a “smoking gun” that they were seeing gluon saturation, because the bigger signal associated with the same particle number has to be due to more gluons at the initial stage, before the collision. Q. What kind of further tests can you do? A. The LHC will get a lot more data to test these ideas from the proton-lead run coming up this winter. Our models are so well detailed that a significant deviation would be able to knock down the model. That’s a good thing. A sign of a good model is that its predictions are sufficiently detailed and clear that it can be tested and even disproved, and one learns something in the process of doing so. If this idea of the color glass condensate is to fail, we would still learn a great deal from the failure of these ideas and we’d have to think deeply about what would replace it. Even though our model works, there are a number of fundamental things we do not understand and are forced to model imperfectly. That is why we really need an electron ion collider, where we could collide electrons with heavy ions to probe the structure of the gluon fields directly. Though it may not have the tremendous energy reach at the LHC, an electron ion collider would allow us to explore the structure of matter with much greater precision. Subtle details of the properties of these extreme states of matter will give us a much more detailed picture, at the most fundamental level, about the structure of matter. But in the meantime we can do some very interesting things at RHIC. One thing we’d like to do, which we are talking about at the workshop taking place this week, is to collide polarized protons with heavy ions at RHIC. RHIC is the world’s only polarized proton collider, where the spins of the particles (and thus the quarks and gluons within) can be aligned in a chosen direction. When the spin of the polarized quarks and gluons in the proton interact with the gluon shockwave of the nucleus, the spin can be changed in different ways, depending on where the proton travels through the nucleus. Teasing out how the spin directions scatter off the internal gluons will help determine how dense that gluon field is at different parts of the nucleus. These studies may help us understand how the orbital motion of the quarks and gluons within the proton contributes to proton spin. And they give us a different way of probing gluon saturation. Q. What will confirmation of gluon saturation mean for physics—and the rest of us? A. We are studying the structure of matter in its most fundamental form to learn something very deep about the structure of the proton, the most fundamental stable piece of matter we know of in the universe. We are going further than our wildest imagination ever thought possible. What we once thought of as fundamental objects are turning out to be much more complex. What is the origin of visible matter in the universe? It is the quarks and gluons. And we are probing the complexity of those particles as much as possible under the most extreme conditions. We don’t really know where that will lead. It could open up completely new directions. 100 years ago, people were asking the same kinds of questions about electrons and photons, which we now use in so many ways in our everyday lives. If you had told them then that there would be something like our National Synchrotron Light Source (NSLS) accelerating electrons and using photons to look at atomic-level structures of things like superconductors, proteins, and ribosomes—to make better materials for energy applications or drugs to treat disease—they would never have believed you. But those are the kinds of advances that come out of in-depth studies of subatomic particles and their interactions.